Wow, where do the days go? Feels like just yesterday school was getting out, and now it’s just about time to head back! To help you savour every last moment of summer vacation…. we’ve put together a list of some events and activities around town you might want to check out. Friday, Saturday & Sunday you can head down to MainStrasse Village in Covington for the World’s LARGEST Yardsale! Tons of fun bargain hunting to be had, and when you’re done, stop by the Candy Bar on 6th Street for a tasty treat. Hours are 4-8pm each day; for more information call 859-491-0458. Toot, Toot! All Aboard! Did you know that Cincinnati has a railway museum? Yup, it’s located in Covington… and it’s open to the public this Saturday from 10am – 4pm. Visitors can see life size trains as well as models. Cost is $4 for adults, $2 ages 10 and under. For more information visit the Greater Cincinnati Railway Museum website or call 513-574-7672. Does your little one like lizards? Than you’ll want to head to McFarlan Woods on Westwood Northern Boulevard Saturday from 10am – Noon for it’s FREE salamander search. Participants will search high and low for the little creatures. Visit the Cincinnati Park Board website for complete details & directions. If you haven’t yet been to Rabbit Hash, KY, then this is a great weekend to go. 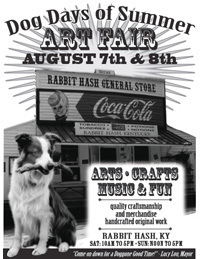 Saturday (10am – 5pm) and Sunday (12pm – 5pm) the Rabbit Hash General Store hosts it’s annual Dog Days of Summer Art Fair. In addition to art from local artists attendees will enjoy live music, food, fire eaters (!) and more! For more information on this FREE event, call 859-334-3151 or visit the Rabbit Hash website. Into magic? Head to the Amelia Branch Library in Clermont County Saturday at 11am and watch Magician Jason Jacobs perform his amazing magic tricks. The event is FREE, but registration is requested. Call 513-752-5580 to sign up. Gotta Get Some Geotta? Then you won’t want to miss Glier’s Goettafest this weekend on Riverboat Row in Newport. 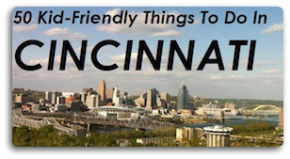 In addition to yummy goetta-centric foods, attendees will enjoy live music, games, rides and more. Free to attend; hours are Friday, 5-11pm; Saturday, Noon – 11pm; Sunday, Noon – 9pm. For those of you with little ones, Friday the Covedale Branch Library on Glenway hosts Baby Storytime from 10-10:30am. Participants will enjoy lap-time fun with books, songs & more. Open to ages birth – 1year. Call 513-369-4460 for more information or to sign up. Don’t miss it! The Boone County Fair runs through Saturday, August 7. Held at at the fairgrounds in Burlington, the cost of admission is $8 for everyone ages 3 and over. This includes all grandstand events and rides. Kids 2 and under are free at the gate and are charged $2 each per ride. The Beechmont Players present Jack and the Giant on stage at The Anderson Center, Friday (8pm), Saturday (8pm) and Sunday (3pm). Open to all ages, tickets are $12, $10 seniors and students. For more information call 513-233-2468 or visit the Beechmont Players website. Loosen up your waist bands, it’s time for the Taste of Colerain! Get ready for delicious food, music and more this weekend at the Colerain Township Government Complex. Fun includes music by Cross-Tie, Naked Karate Girls, Midnight Special and Ooh La La and the Greasers. For more information call 513-385-7503 or visit the Taste of Colerain website. Want to take in a movie? On Saturday, Fountain Square Movie Night features Charlotte’s Web. Previews start at 7pm. Bring your lawn chairs and snacks. Movie is free, parking is available under Fountain Square or in the Westin Hotel garage (these are my faves…). It’s time for Deerpark’s A Day in the Park festival at Chamberlin Park. Great food, live music and more! Runs Friday, Saturday & Sunday. For complete details, check out their Facebook page. This weekend also brings the St. Therese Little Flower Festival. Spend Saturday (5:30 – Midnight) & Sunday (2-10pm) enjoying games, rides, booths, entertainment and more. For more information call 513-541-5560.